Le Cordon Bleu Paris has one of the biggest roof top gardens in the capital. The benefits to the institute from this innovative approach are threefold. Firstly it serves as an educational tool in teaching students the multiple stages in the growing of fruit and vegetables and all about produce seasonality. Le Cordon Bleu Paris was in fact the first signatory on the Charter of Commitment to Seasonality and Quality created by the Collège Culinaire de France. Basic level Culinary Arts students have the opportunity of exploring the vegetable garden and tasting the different produce grown there. The company Ecovégétal, professionals in the field of roof top gardens, lead the students in their visits to the garden. 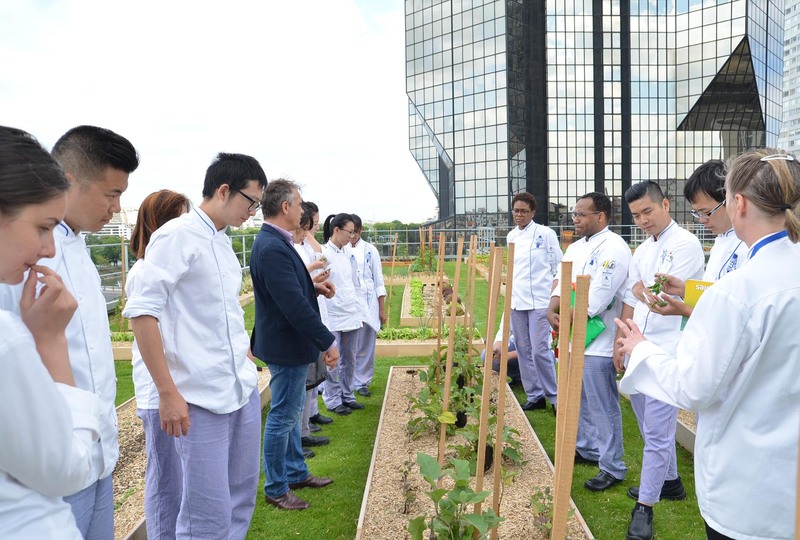 Curious-minded and keen to learn, they will soon take part in a new lesson to learn more about how to cook fruit, vegetables and aromatic herbs that they came across on the vegetable garden roof of their institute. The company Ecovégétal, professionals in the field of making roofs and car parks into green havens and soil stabilisation, was in charge of the visit and will return to give forthcoming lessons to students. This unique roof area is also part of a precursory movement where urban agriculture and green belt development come to the fore in environmental priorities. With more than 2500 aromatic plants and vegetables, as well as 3 beehives and an insect hotel, the garden provides true support for the biodiversity of the city. Finally, the fruit, vegetables, herbs and edible flowers harvested make up part of the ingredients used for the Cuisine and Patisserie demonstrations, as well as for production at Le Café.